1. Facebook content isn’t as sharable as you think. When it comes to cross-platform content sharing, Facebook lags far behind its top competitors. 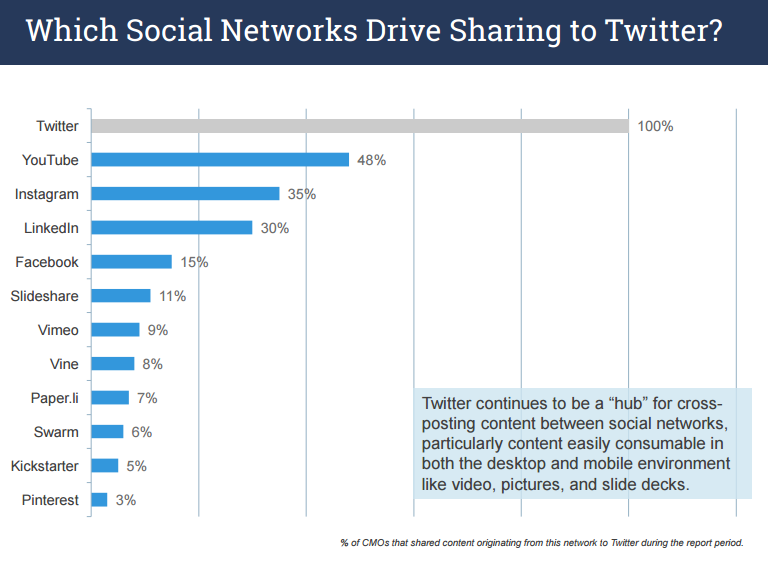 In other words, content found on YouTube, LinkedIn, and Instagram are (at least) twice as likely to be shared on Twitter, than content found on Facebook. Marketing executives’ sharing of LinkedIn content on Twitter is up by 200%, so if you want to get noticed, you better step up your game on LinkedIn because CMOs are consuming and sharing that content. 2. (Visual) content is king. If you want a marketing executive to share your content, you better make it visual because this study found that pieces of content that had a visual component were more likely to be shared. I would argue that this isn’t just for CMOs; much of our own content is more shareable if it’s visual. See for yourself – head over to analytics.twitter.com and look for your tweets with the most engagements. Mine are always images, with very few exceptions. 3. Location-based social networks are dead. Only 5% of marketing execs check-in (down from almost 30% from 2 years ago). Remember Foursquare? Yeah, nobody does. Three years ago I stopped checking-in on Foursquare. Before that, I was a consistent user checking in to the bus station, bus route, different buildings on campus, and even different carafes at Starbucks (Yes, the jugs they hold the different types of coffee in). I finally felt that all this checking-in was feeling like a chore and had little or no reward attached to it, so I stopped. I imagine others felt the same way. For the cost of your contact details, you can download the full report from their website. 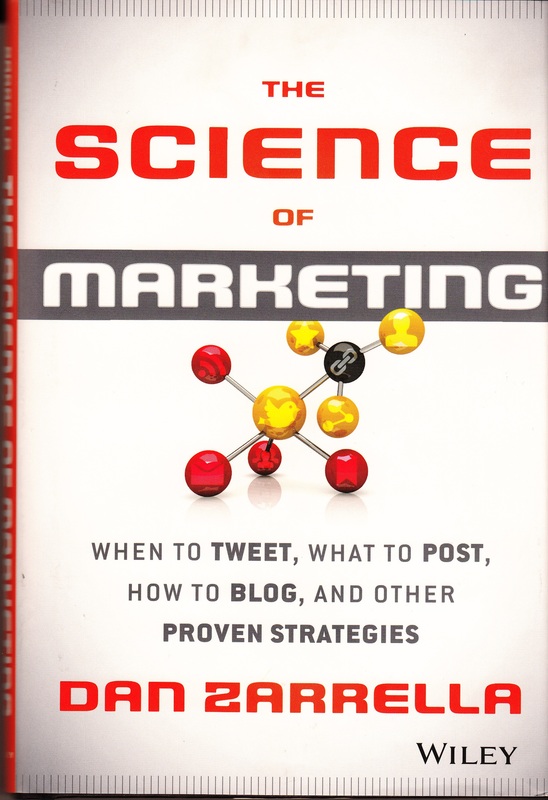 It’s a great piece of content marketing about content marketing. 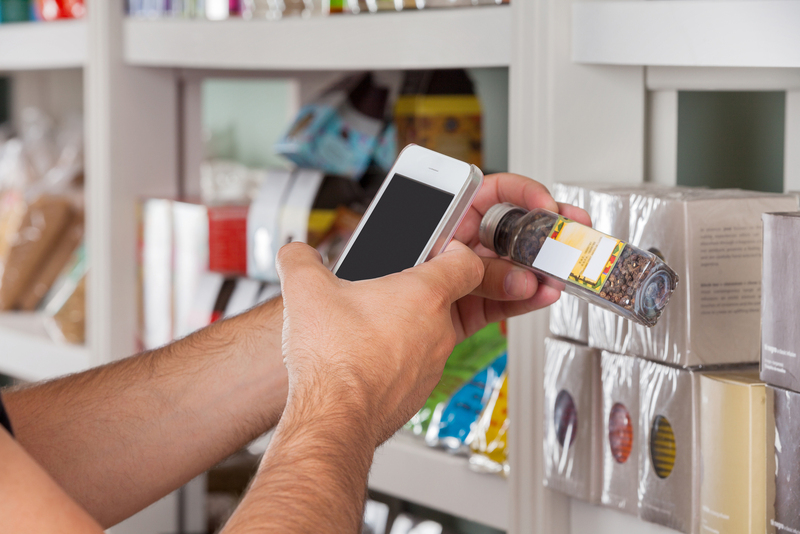 A recent survey says 50% of customers are using their smartphones to compare competitor prices while in-store. CRM software providers crowdtap published an infographic (below) this month to share some emerging trends in the ability of social media to influence consumer behaviour. After surveying over 3,000 US customers in 2013, and again in 2014, they found that social media is increasing its value to businesses who want to influence buying decisions throughout the holiday season. 1. Amazon reviews are almost as trusted as peer recommendations. I was a little surprised to see the difference between trusting a peer and trusting an online review was only 5 percentage points. I suppose this speaks to the importance of hearing directly from an existing product owner, rather than just trusting somebody in your network who you happen to already know who may not actually own the product. 2. Facebook dominates. If your business is only going to participate in one social media activity, you better make it Facebook. The survey results suggest that people are turning to Facebook, more than any other social network, to research gifts, look for promotions, and share their purchases. The only category where Facebook finished second was “gift inspiration” – losing the top spot by only one percentage point to Pinterest. Twitter seems to be rounding out the bottom of each of these categories. Perhaps this could be due to the transient nature of the messages, and also because Twitter relationships are often centered around topics of interest rather than trusted personal connections. 3. People are shopping at your competitors, right from within your store. The survey results suggest that 50% of the people physically walking into your store will whip out their device and check a competitor’s price to see where you compare. I do this. I do this all the time. I expect this trend to continue to grow year-over-year. 4. Social media supplants TV as the most popular source for “inspiration”. For the first time, we’re relying on social media to provide us with gifting ideas more than any other medium; overtaking traditional television’s historical dominance in this area. This could be a symptom of the declining TV viewership numbers across every age demographic – with the largest decline in television consumption belonging to the 18-24 segment. How does social media impact your holiday shopping behaviour? Check out the following infographic, and let me know what you think. This Sunday. 6:30 p.m. EST. Finally. For the first time since January 29, 1995, my San Francisco 49ers have made it to the Super Bowl. This is a big deal to me because the sports teams I root for typically don’t make it to the final game (Toronto Maple Leafs last Stanley Cup – 1967) ( Toronto Blue Jays last World Series 1993). But when any of these teams were last at the big dance, social media was nowhere to be found…it just didn’t exist. Now the non-stop flow of photos, tweets, taunting, scandal, and general nonsense is almost nauseating. ESPN posted an inforgraphic about who to follow on Twitter; Hootsuite has a dashboard where you can track what quarterback has the most tweets, day-by-day; and at last check, social media mega-blog “Mashable” has 144 recent stories tagged “Super Bowl”. It can all be a bit overwhelming. Don’t get me wrong, the enjoyment of these global events is enhanced by social media. I love being able to connect with fellow sports fans and chat about game. My favourite fan to connect with is the one who is actually there. Enter the Twitter account from the New Orleans Host Committee. If you are looking for one social media touch point for the big game, this is it. The @nolasuperbowl account is entirely focused on fan (user) experience, and they sure are responsive. Powered by a team of over 100 volunteers they field questions, suggest places to eat, share interesting stories about the game, promote their activities (#NFLexperience), and share photos from the festivities. I’ll definitely be watching the @nolasuperbowl along with the game this weekend with a big thanks to all the volunteers that make it happen. The video below provides a decent idea about what it’s like to be inside the command centre during Super Bowl Week. It’s a recap from last year’s Super Bowl in Indianapolis, but it does a good job explaining what they are looking for, how they find it, and how the team of social media volunteers go about responding. UPDATE (01.31.13): As a further comment to their responsiveness, after I initially shared this post on Twitter, the @nolasuperbowl account was quick to RT. In fact, they were the first to do so. Thank YOU! MT @david_hall: The ONLY Super Bowl account you need to follow – http://t.co/GodQuOhp – @nolasuperbowl is doing a great job! Phil and Dave talk turkey on this week’s show with coverage of Black Friday and the role Facebook played in this year’s Presidential turkey pardon. We also take a look at foursquare’s dismal 2012 revenue predictions and the latest in the Apple vs Samsung saga. We have two Hashtag Fails of the week this week. First, we chat about Lindsey Stone’s tasteless Facebook photo that got her in hot water with her boss. We also look at slow performing websites and how much it costs businesses annually when their sites take longer than three seconds to load. And finally, our YouTube (anti)Hero this week is Nicole Westbrook. Her video “It’s Thanksgiving” has become the third most disliked YouTube video of all time, and it was only released on November 7, 2012. If you liked the show, feel free to subscribe to this blog or our RSS feed to make sure you’re always up-to-date with Talknowledgy. We’ll be back in a little while!